At LifeSite we see that Archbp. Viganò has released another statement. If [the Pope] had said: “Viganò lied,” he would have challenged my credibility while trying to affirm his own. In so doing he would have intensified the demand of the people of God and the world for the documentation needed to determine who has told the truth. Instead, he put in place a subtle slander against me — slander being an offense he has often compared to the gravity of murder. Indeed, he did it repeatedly, in the context of the [short daily St. Martha sermons during] celebration of the most Holy Sacrament, the Eucharist, where he runs no risk of being challenged by journalists. When he did speak to journalists, he asked them to exercise their professional maturity and draw their own conclusions. But how can journalists discover and know the truth if those directly involved with a matter refuse to answer any questions or to release any documents? The pope’s unwillingness to respond to my charges and his deafness to the appeals by the faithful for accountability are hardly consistent with his calls for transparency and bridge building. The plot very much thickens as the heat is applied. This entry was posted in The Coming Storm, The Drill, The future and our choices and tagged Archbp. Viganò, The Viganò Testimony. Bookmark the permalink. Powerful is too weak of a word: Surely he’s either incredibly gutsy or else some version of deranged or demonic, and I cannot get my head around that second or third option; they just do not ring true. His agony over having to do what he then did surely does ring true for me personally— knowing when you have to speak the truth, no matter what, and then doing it. That can be most painful, just as he says. And, as he requests, let us pray that Cardinal Ouellet can man up to the task Vigano has handed him; he could not have stated better his request. Since Card O caved on Amoris laeitita, however, that manning up is not a given. Vigano’s reminding him of that, however, was a stroke of genius in knowing how to reach a person’s better instincts. Lord have mercy on your Church! Pope Francis and his remarks about the Great Accuser are so devious that I think we can compare Archbishop Vigano to Judge Kavanaugh, and Pope Francis to a Democratic Senator. I am aware that my comparison is somewhat frivolous, but the Democratic blathering on the judiciary committee do remind me of the convoluted remarks that Pope Francis makes. I worry for my church and my country. I deeply disliked reading that, because I’m afraid it might be truthful, and on top of that, it might successfully be swept under the rug. In the “accuser” homily, the Holy Father spoke of the devil revealing the sins of bishops. He did not dispute the sins, but only criticized the source and intention. And so, the homily seemed to me to be a general admission of guilt. It does not say who, exactly, is guilty of what, but it says generally that bishops are guilty of things recently revealed. The Archbishop may be in hiding, but he is not hiding, and this letter is perhaps more forceful than his prior one. It will be interesting to see if either Cardinals Ouellet or DiNardo respond to his appeal to them to reveal what they know. I would like to know what the Pope’s opinion of St. Stephen is. He was stoned to death after denouncing the Council. Also, I wonder what his opinion is of St. John the Baptist, and all the Old Testament prophets? Christ talks about the Old Testament prophets in His woes in Luke 11. If people go to The Pope Francis Little Book of Insults on the web there is a listing of his ad hominems. It is quite a papal rock pile. I find his letter actually quite reassuring, about Jesus being in full command of the boat. It’s a good “homily”. The contrast between that and the “accuser” series of Santa Marta homilies is remarkable. Archbishop Vigano has a great moral credibility at this time and I trust him. Who are the two homosexual friends of the Congregation for Bishops, is this McCarrick and Maradiaga? Elizabeth, I picked up on that too. He doesn’t refer to the two prelates as “homosexual supporters” but as homosexuals themselves. The truth is this ‘pope’ can’t hide from his sins, because they are prima facie true; he can only dodge and re-direct, in true modern Jesuit fashion. I see a schism coming for the Church. We do not need Vigano to tell us what kind of man we have in the papal office. His public acts, committed and omitted, and his public statements, committed and omitted, tell us everything we need to know. Vigano’s public witness tells us about Vigano just as the silence of many who are in the know tells us about them. The recent article about Pope Francis in Der Spiegel is far more damning than anything Vigano said, because it’s by a respected newspaper, albeit one with a liberal bent (and therefore not in the category that is likely to criticize the Pope), it was exhaustively researched, and it directly implicates the Pope in covering up sexual abuse when he was Archbishop of Buenos Aires, including interviews with witnesses and victims. The filth just keeps piling up and sadly all the Holy Father can do is remain silent and hope it goes away-which it will not. I think Vigano’s approach is one we need to pay more attention to. Stop petitioning the bad Cardinals, Bishops, etc. They dont care. Put pressure on the good ones, the Luke warm ones to reveal what they know. Do you think that the good guys dont know more? Now is the time for them to form a United front to condemn this evil, name names, and offer their brothers a public correction with demands to confess(publicly), repent or resign. The tipping point in this battle will be if and when one of the bad guys flips and reveals the inner workings. Pray for that, and put pressure on the good guys to find that critical player and convert him. My fear is that good Catholics might succumb to the urge to see the secular authorities come in and “investigate” to shed light and fix the gridlocked problem. But, further down the road, such a precedent merely insures that secular authorities will then often come in to re-direct the Church to a position of being subject in all things to secular authority. Satan will love that. From the beginning I have thought that the handful of good and holy bishops should drop everything and go on a retreat together. Confession. Holy Eucharist. Prostration before our Lord. Prayer. Then, with the intercession of the Holy Spirit, come up with a plan. It should probably not be made public, but some of the good and holy faithful should know so that their retreat could be covered with our prayers, too. I believe that there are many cowardly bishops (my own included) who are living in fear, making milquetoast bureaucratic statements on the despicable behavior of their brothers. They need to know that the faithful will have their back, and that they will find safety in numbers with the retreat bishops, if only they will step out boldly. I am also reminded daily of a homily given by Bishop Vasa when he was in Oregon, explaining that the Maccabees mother lost her sons in torture but gained nothing in this world. He explained that she is an example to us about following those silly little rules of God, even when they are out of season. Wish I could find that now. Nabi Sayeth: Lust for Power and Prestige Pollute the Church! Worse still, he holds that the guilty should be allowed to get away with it in peace. 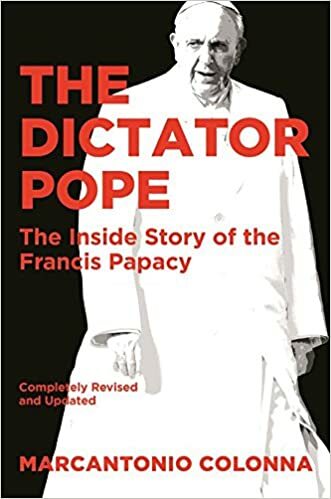 I am reading “The dictator pope” by Henry Sire, and had to stop reading for today, because it’s just too intense. The depth and extent of pure evil and cynicism in the highest echelons of the Curia, with tacit support of Francis, is just to disgusting to bear. The fact that good and faithful bishops who wish to do something about it, like Abp. Vigano, are persecuted and have to live in hiding, adds insult to injury. But, oddly enough, having read this post, I feel reassured – this will not go on forever. Every dark night eventually comes to an end, the longest and harshest of winters is always followed by spring. The liberal circle of the original Team Francis that propelled him into power is a bit long in the tooth, and, soon enough, the biological solution will work its course. Francis himself is not exempt from where all men must go, even should his lamentable pontificate last another couple years. In pulverem reverteris – it seems to me some of the homosexualist agenta supporters in Rome have completely forgotten about that. Basically, we need to wait them all out, of course trying to limit the damage they are doing to the Church in the meantime – as much as we possibly can in our state in life. Like the good Archbishop said – thankfully, it is not Team Francis that controls the Boat! Father Z, if you have the chance sometime, I’d be very interested in reading any thoughts/background you might have on the origins/usage of the word “testimony” as it pertains to +Vigano’s statement. I tend to view the word as implying some weight – a public statement, subject to questioning. The dictionary definitions lean that way a little – declaration under oath or affirmation, evidence, open/public declaration. …What we have seen from +Vigano – a “public” statement (or perhaps more accurately, a statement made to the public but not in front of or among the public), from some insulated place, not much opportunity to be questioned, aided in preparation by a sometimes journalist/blogger who sounds more like he polished it for him as a collaborator than questioned him as a journalist… it falls a little short of “testimony”. Is it perhaps a different connotation in one of the languages (other than English) that +Vigano or his collaborators speak and would be working from? I have viewed the allegations as credible in the sense of opportunity – the people/things he talks about are ones he would have been in a position to have seen – while maintaining some skepticism of the truth of the allegations in absence of further information. Not thrilled with either his “undisclosed location” approach or Pope Francis’ non-responses.